For decades researchers have recorded sounds from whales and other marine mammals, using a variety of methods including passive acoustic monitoring (PAM) to better understand how these animals use sound to interact with each other and with the environment. Now, for the first time, researchers report using this technology to record spawning cod in the wild. Acoustic behavior in cod has been of interest for several decades, but few studies have observed their use of sound as part of reproductive behavior. Although both sexes produce low frequency "grunts", only male Atlantic cod make this sound during spawning season. Researchers from NOAA's Northeast Fisheries Science Center (NEFSC) and their colleagues from the Massachusetts Division of Marine Fisheries (DMF), Stellwagen Bank National Marine Sanctuary (SBNMS), School of Marine Science & Technology at UMass Dartmouth (SMAST), and Cornell University's Bioacoustics Research Program recently reported their findings, online, in the ICES Journal of Marine Science. "Few current coastal cod spawning sites are known, especially given historical data that indicate many cod spawning sites once existed along the New England coast. Passive acoustics makes locating potential sites much easier." said study co-author Sofie Van Parijs, who heads the passive acoustics group at NOAA Fisheries' Woods Hole Laboratory. The findings have implications for conservation and management of this iconic species and possibly for other recreational and commercial fish species. Species in more than 100 families of fish are known to produce sounds. 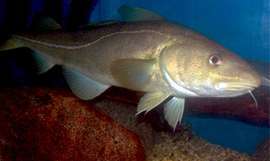 The cod family contains several sound-producing species, including haddock (Melanogrammus aeglefinus), pollock (Pollachius virens) and Atlantic cod (Gadus morhua). The researchers report on a 2011 pilot study in northern Massachusetts Bay. A single marine autonomous recording unit (MARU) was deployed at a depth of 51 meters (168 feet) within a seasonal fishery closure area established to protect a coastal cod spawning aggregation. The MARU recorded continuously for 75 days during the spring spawning season, with the acoustic sounds confirmed as cod grunts. Cod were also captured in the vicinity of the MARU as part of a tagging study being conducted concurrenty at that time by the Massachusetts Division of Marine Fisheries (DMF) confirming that cod were present. "We acoustically captured the start of the 2011 spawning period but not the end," said Van Parijs. "Future deployments of multiple MARUs over larger areas and in conjunction with tagging studies could help determine movement patterns of cod in the spring, and give a better picture of how cod are distributed within the spawning protection area. In addition, underwater cameras could provide insight into the structure of the spawning aggregation." Atlantic cod are known to gather in high concentrations in very small areas to spawn, sometimes forming vertical columns or "haystacks". They often return to the same location to spawn, a behavior known as spawning site fidelity. In the spring of 2012, the researchers deployed an array of nine MARUs in the same area as the 2011 pilot study to record cod acoustics through an entire spawning season and over a larger area. Lead study author Keith Hernandez, formerly a researcher in Van Parijs' group at NEFSC and now a graduate student at Moss Landing Marine Laboratories in California, says human-produced sounds might mask cod grunts in coastal areas with high human activity, an issue of concern since grunts and other sounds can be used to advertise for females and warn off competitors. The next steps for passive acoustic monitoring are to explore the size and extent of known cod aggregations, and to locate other spawning aggregations in the Gulf of Maine and Georges Bank region. Researchers also need to determine if the grunt data can be used to develop an index of relative cod abundance. "We're already looking at the acoustic data we've collected from other projects in the region, including the Ocean Noise Budget in the Stellwagen Bank National Marine Sanctuary and other offshore monitoring studies," said Van Parijs. "We continue to work with colleagues at the Mass DMF, whose cod tagging studies contribute core information and complement federal efforts." Impaired recovery of Atlantic cod -- forage fish or other factors?